Crispy Chicken Bites – quick, easy, delicious. These small bites are a favorite around my house all year, but especially during parties. Kale Chips – Have your kids tried kale chips yet? Don’t let the fact that they are a leafy green fool you (or your kids). You may be surprised how quickly these disappear. YUM! Holy Guacamole and Skirt Steak Tacos – Guacamole is such a kid-friendly staple that I sometimes have to make a “spicy” version to ensure that my husband and I get some of our own. Steak tacos are a great, make-it-yourself option for a party setting as well. Let the kids get involved with making their own dinner. White Pizza With Arugula – Put a fun twist on a standard pizza with this white pizza recipe. Every party deserves a little something unexpected. Butternut Squash Mac and Cheese – Dress up this family favorite with this antioxidant and phytonutrient powerhouse. Butternut squash is a healthy, delicious alternative and you won’t miss ALL that extra cheese for a second. Slow Cooker Chicken Fajitas – Who doesn’t love a slow cooker recipe any day of the week, but this delicious recipe makes party prep so much easier. Baked Sweet Potato Chips – Set these chips out of the table and watch the kids ask why they’re orange. Then watch then devour each and every one. Mini Taco Cups – Put those taco chips to good use and fill them with taco fixings! Kids love eating with their hands and this makes another build-it-yourself party meal. All Things PLATE ART – While we’re at it, let’s make ALL the food fun! Nothing says “it’s a party” like a peanut butter banana waffle butterfly. Check out this page for more football inspiration. Black Bean Brownies (That Fooled My Husband!) – Yes, it can be done. And no one will ever know. Super Bowl Games for Kids – Kick off the pre-game festivities with one of these fun games that get the whole party involved. Football Crafts – Have the kids makes some pom poms or a football paper chain to decorate the party room. Make Your Own Party Mix – Try this homemade chocolate-cherry mix as an alternative to Chex mix this year. 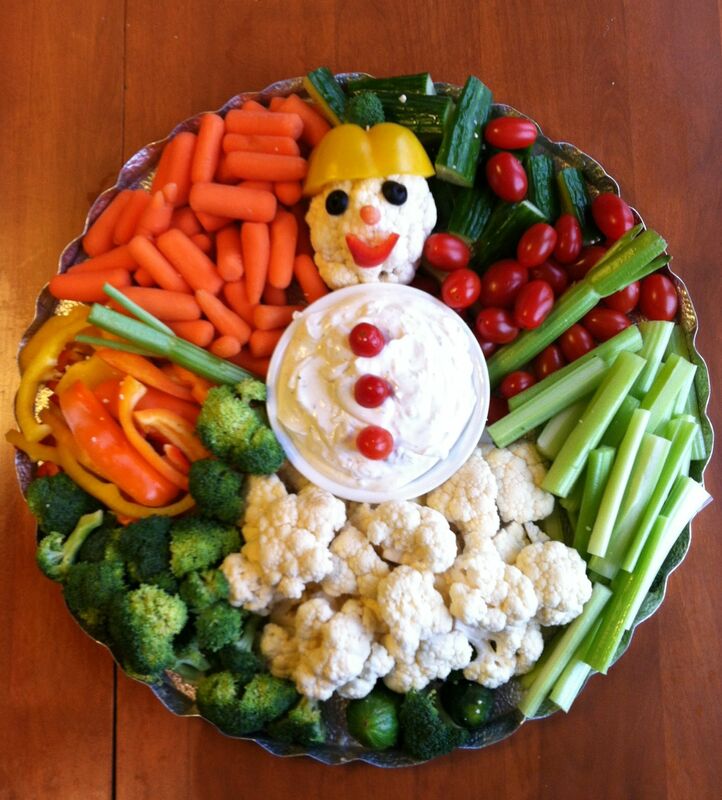 Snowman Veggie Tray – Christmas might be over, but the snow fall is not. The kiddos will love this frosty inspired tray and the parents will love the healthy options it features. Nachos – baked chips, organic cheese, delicious veggies – What Super Bowl party would be complete without some nachos? Use organic cheese, real, whole ingredients and nothing should stop you from enjoying this party treat. Be sure to check out MySuperFoods for great healthy snacks for your whole family!